Contrary to what most journalists and many academics argue, an “oversupply” of people with PhDs is not the primary cause of the decline of tenure for college faculty in the U.S.
Second, analysis of non-tenure track employment for college faculty reveals that the replacement of faculty teaching jobs with gigs has gone hand-in-hand with the systematic devaluation of the PhD as a credential for teaching college courses in humanities, social science and STEM fields (PhDs are not generally necessary to teach in a number of professional fields). People with PhDs not only face fierce competition for tenure track positions in their fields, but must also compete with doctoral students and people with terminal Masters degrees for teaching positions off the tenure track. This has effectively undermined the bargaining position of many people who receive PhDs, and reduced college student access to instructors who have ever published original scholarship in the fields that they teach in. It is common for journalists to describe the difficulties of people with PhDs finding work as an inevitable effect of impersonal market forces of supply and demand. Stories like “A Glut Of PhDs Means Long Odds Of Getting Jobs”, or “Doctorates Up, Career Prospects Not” follow a predictable template. First, they contrast PhD completion rates (the supply) with the number of tenure track job hires (the demand) to identity what they refer to as an oversupply of people with PhDs. Second, they use anecdotal personal stories to explore the human suffering caused by tight job markets. The argument that there is an oversupply of people with PhDs depends upon ignoring non-tenure track jobs as part of the “demand” for college instructors. College enrollment has grown by 90 percent in the last forty years (from 11.1 million to 22.3 million), but colleges and universities have not hired tenure track faculty in sufficient numbers to meet this demand. While the total number of college instructors in the United States has more than doubled since 1980 from 675,000 to 1.4 million, the total number of tenure track faculty only increased by 22 percent. Stories of people’s struggles to obtain tenure track jobs make it appear that the job market simply cannot accommodate most people’s dreams of becoming a college professor. But they ignore that during the past 40 years, the number of faculty ineligible for tenure grew by over 250 percent, and the number of graduate student instructors grew by 123 percent. When non-tenure track positions are included in calculations of demand for people with PhDs, the demand for college instructors appears much larger, and the supply of people with PhDs seems much less problematic. Contrary to the suggestion that it has become impossible to find work in higher education, the majority of people who received PhDs in 2014 either had a teaching job or postdoctoral position lined up when they graduated, though between 29 and 46 percent of them did not (depending upon what field they were in). Doctoral program completion rates and the supply of tenure track faculty job openings certainly influence the academic job market. There is some evidence, for instance, to suggest that a recent spike in the number of PhDs granted in STEM fields has made it more challenging for people with PhDs to find faculty positions in the last 5-10 years. In Education and the Humanities fields, it appears that reduced hiring during the recession, not increased numbers of people with PhDs, has contributed to higher rates of unemployment for people with PhDs. As a graduate director, I have also been struck by the fact that some graduate students deliberately limit their postgraduation job search to one narrow geographical area. Indeed, some history PhDs take adjunct and one­year teaching jobs because they want to stay in a certain area, or because they have family or other responsibilities that proscribe locational options. There are clear labor­market ramifications to these collective preferences, because employers will always be able to count on a supply of willing part­time workers. We hope that larger numbers of newly minted PhDs pursuing opportunities outside the academy will lower the supply of faculty willing to take part-time, low-paying jobs. While workers’ “collective preferences” do have “labor-market ramifications”, Jones seems to be basing her explanation for the decline of tenure track jobs on conversations with people whose preferences have not shaped the labor market as much as she presumes. What observers like Jones overlook when they complain about the “preferences” of people with PhDs to accept poorly-paid, temporary work is that the vast majority of non-tenure track faculty do not have PhDs. During the 2003-4 school year, the last year for which there is reliable data on the subject, only 23 percent of all contingent college faculty in the U.S. had doctoral degrees. Community colleges were at the vanguard of hiring faculty without PhDs, with only 20 percent of their tenure track faculty and 9 percent of their non-tenure track faculty holding doctoral degrees. 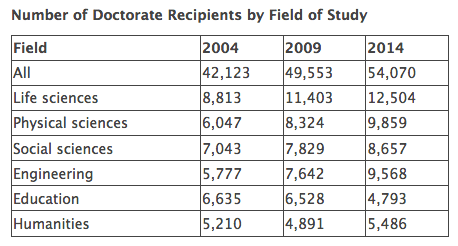 But community colleges were not the only institutions hiring faculty off the tenure track without PhDs. In 2004, only 30 percent of adjunct faculty at four year colleges had doctoral degrees. 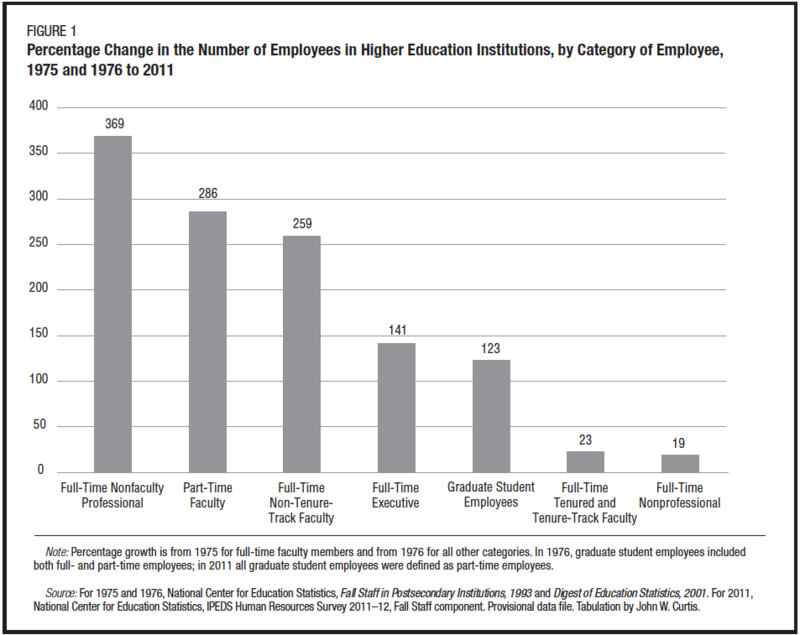 In the Fall of 2011, two thirds of the 1.1 million instructors at four year colleges in the United States were off the tenure track. I witnessed the implications of both the decline of tenure and the decline’s effect upon the hiring of people with PhDs while teaching U.S. History at a branch campus of California State University in the Fall of 2015. In the History department where I taught, 60 percent of its 55 faculty were off the tenure track, and only 25 percent of its non-tenure track faculty had PhDs. 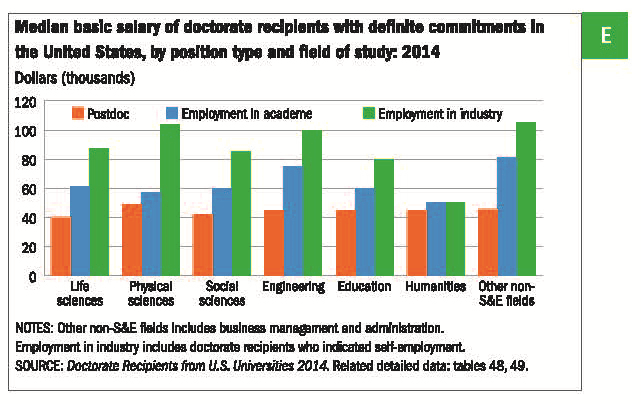 People without PhDs are playing an enormous role in the academic job market. With 66 percent of all college faculty off the tenure track, and perhaps 23 percent of non-tenure track faculty holding PhDs, it is likely that more than 50 percent of all college faculty in the U.S. do not have doctoral degrees. They are the majority. Yet observers keep blaming people with PhDs for the decline of tenure, rather than analyzing how the decline of tenure has made a PhD increasingly superfluous for getting a job as a college instructor in the U.S..
By de-valuing the PhD as a credential for college instruction, college administrators have massively expanded the supply of job candidates, thereby allowing them to reduce teaching salaries to poverty wages. The average annual salary of a part-time lecturer (or “adjunct” faculty) with a PhD is an abysmal $26,321, which is less than the stipend that most Ivy League graduate students receive just to read books and write papers. The average annual salary of a part-time lecturer with an MA is an even more astonishing $14,272 per year. That’s 120 percent of the federal poverty level, and worse than the average salary for some college instructors without any graduate degrees! So it really doesn’t matter whether doctoral students and people with terminal Masters degrees are better or worse teachers than tenure track instructors. Nor does it matter that one may not need a PhD to teach introductory courses in Math, English composition, History, foreign languages, and other subjects that tend to be taught by non-tenure track faculty. Higher education administrators and department chairs do not, for the most part, hire non-tenure track instructors for pedagogical reasons. They hire instructors who are ineligible for tenure— including graduate students from their own departments— because these instructors have less bargaining power than tenure track faculty to negotiate a decent salary. The effects of this push for cheap instructors go far beyond the hyper-exploitation of those without PhDs. For people with PhDs in the Humanities and Arts, the collapse of their bargaining power in higher education has been more severe. As the chart above indicates, whereas 95 percent of tenure track faculty in the Humanities at four year colleges in the U.S. have PhDs, only 33 percent of non-tenure track faculty do. That’s about 20 percent less than faculty in Social Sciences and Natural Sciences at the same types of institutions. With most instructors in the Humanities not needing doctoral degrees to teach college, even at four year colleges, people with PhDs in Humanities fields have become the lowest paid people with doctoral degrees in the U.S.. The salaries for college instructors with PhDs in Humanities are not only the lowest of all faculty; they are roughly equivalent to the salaries they could receive by working in non-teaching jobs, often for positions that do not require graduate degrees. The declining value of the PhD is not the primary cause of the decline of tenure (growing costs of education and declining public support to meet those costs are more significant). But opening faculty searches to people without PhDs facilitates the decline of tenure, because hiring instructors without PhDs undermines the bargaining power of all faculty, and thereby increases schools’ financial incentive to hire faculty off the tenure track. Wrestling with the systematic decline of the PhD as a credential for college teaching exposes the class divide between faculty lurking beneath the surface of academic departments across the country. Which faculty should have PhDs? Should publishing research in one’s field be a necessary a qualification for teaching at the college level? These questions have become flashpoints for serious class conflict between faculty in departments that have outsourced the teaching of their introductory courses to instructors off the tenure track. How do you reverse the decline of tenure? Most tenure track faculty want to convert adjunct lines to tenure track lines using open searches. This approach would restore tenure in schools across the country, to the benefit of recent recipients of PhDs, and at the expense of current adjunct and graduate student instructors. Most non-tenure track instructors, however, want to promote adjunct faculty to tenure track positions without open searches, based on seniority. The conflicts over these two strategies become more heated, and more personal and potentially toxic, when they inevitably veer into ethical debates about whether schools have moral obligations to continue to employ longtime instructors who have effectively turned adjunct teaching into a career. It is this debate over how to respond to the decline of tenure, especially as it relates to schools’ increasing reliance upon college instructors without doctoral degrees, that will be the subject of my next piece for the LAWCHA blog. Featured image credit: Harishwer Balasubramani, The Daily Bruin, 2015. The rise of contingent or precarious contracts within academic markets is the latest manifestation of the regulatory failures that bedevil delicately balanced apprenticeship institutions. Unions exist in Tennessee, but they are hindered by the hostility of not just management but also by state government. 1. One factor you’re not accounting for in the systematic devaluation of college teaching is our own bad habit of devaluing it ourselves, especially gen-ed/lower division teaching, which happens in this piece too. I’ve argued this at some length on my own blog, but in short–every time we tell management that lower-division teaching isn’t as hard or important as teaching majors or graduate students, WE invite them to treat the people who teach those courses worse. We, as a profession, aren’t to blame for the deteriorating conditions, but we don’t help ourselves when we do this. So, every time a tenured faculty member says, “Let the adjuncts teach the 101 courses so I can do more important things,” you’re inviting the exploitation of the person who’s doing the job so you don’t have to. Every time an adjunct faculty member says, “I wish I didn’t have to teach this 101 course so I could teach something more important,” you’re tacitly telling management that what you do isn’t worth compensating fairly. Let me say loud and clear, by the way, that I think all faculty should have access to all levels of the curriculum they’re qualified for (I wouldn’t let MA holders teach PhD students, for example). This isn’t an argument on behalf of locking anyone into any level of curriculum. It’s an argument about how we *talk about curriculum* in relation to working conditions. 2. While it may seem obvious to everybody in the world but me, I’m still not clear on why having a PhD should be worth more *if you’re doing the same work* as somebody without one. It’s easy to take for granted, and it may even be true, but let’s pretend it’s not obvious. What’s the evidence? I have critiqued some versions of the adjunct-activist mantra “Equal work for equal pay” on the grounds that, e.g., my 4/4 teaching load isn’t “equal” to the 4/4 load my adjunct colleague carries–because I also have required research and service that even as a tenured full professor I can be disciplined/fired for not doing. That said, I do believe that people who are, in fact, doing equal work should get paid equally for it, and I’m not sure why a credential changes that, unless it’s just a reward for getting the credential. 3. Let’s say, just for fun, that I concede the entirety of Trevor’s argument here. What happens to the thousands of Masters/ABD adjuncts out there who have been working hard and well and in good faith for years? Have they earned anything more than an “Oops, sorry, good luck with finding something you deserve?” I realize that kind of policy discussion isn’t within the frame of this piece, but it’s an important not to forget. As long as Colleges and Universities have the option of hiring adjuncts to teach that 4/4 load for 1/4 of what a tenure-track or non tenure-track full-time faculty member would make teaching the same 4/4 load, there is no reason for those schools to not save the money and hire more adjuncts. As an adjunct who teaches a 9/9/4 load each year at a combined 3 different schools, I am able to piece together a living wage that is roughly equivalent to what I would make as a full-timer teaching a 4/4 load at one school. I could easily finish my PhD at USF and be qualified for that 4/4 full time load; however, there is no motivation for me to do so, since the national job market would force me to have to take a couple 1 year offers somewhere else in the country, since the odds are extremely low that I could get a full-time gig locally (I own a house so I am committed to the local market). In effect, I would be in the position of having a PhD while adjuncting the same schedule I have now AFTER I go into further debt in order to pay for the year off from teaching I would need to finish my dissertation with only a slight chance that I might luckily land one of the extremely rare full-time positions that opens up within one of the schools in a 50 mile radius from my home. I don’t know of any adjunct union that seriously argues the “equal work for equal pay” since we all recognize that full-time faculty have service and research requirements that adjuncts do not have; however, those extra requirements in no way justify an adjunct being paid 2K per class per semester (16K per year on a 4/4), while the full-timer gets 45K for the same teaching load. At HCC, we recently voted to form the first adjunct union in Florida and our goals are not to get equal pay to full-timers, but we certainly think 4K per class (which would still put us 12-15K per year behind our full-time brethren on a 4/4 load) is a reasonable difference between a full-timer teaching at a CC with the same load with service and research requirements and a PhD and a part-time adjunct teaching the same load without the service and research requirements and a Master’s degree. Indeed, if our union could bargain our pay to such a level, I would not need to teach the ridiculous load of classes I teach now. Yet, we are on our own. The full-timers have a different union than us and they view us as a threat to their security so they only discouraged us from forming a union in the first place. Consequently, admin. compare our pay scale to other Florida adjuncts and claim 4K per class is unreasonable when no other adjunct in Florida makes more than 3K per class (save for a couple very difficult to attain positions at a couple Universities that cap at 1 class per adjunct per semester). Until adjuncts who teach 3-4 classes at a school are considered full-time, I highly doubt that even a union will do much to move the pay scale. They can justify their absurdly low adjunct pay scales by classifying us as part-time and pretending that their courses are taught by professionals who moonlight as adjunct instructors for a class or 2 a year, despite the fact that most of their classes are taught by people who not only work full-time for them, but work full-time somewhere else as well. One other thing. It would have been nice if my graduate school professors had informed me during my first year that I would likely be stringing together adjunct jobs at a fast-food pay rate with a Master’s Degree while praying for a full-time CC opening, or that a PhD would likely result in my spinning my post-doc wheels for 30K for several years, while praying to land a 45K base pay TT job at a middle of the nowhere liberal arts school. Instead, they fan the flames of your youthful dreams of earning a PhD and immediately getting a full-time TT job at a reputable school where you will be teaching between book research and semester long sabbaticals in Germany, as if it is reasonable to expect such a career off a PhD from a mid-level University…all while you accrue triple figures in student loan debt. I might have changed my major to education and used a PhD in it to become a part of the administration at one of the schools I currently slave at. They don’t tell you that that dream died for all but Ivy League PhD’s 40 years ago. This is an update on Lassalle’s “iron law of wages” and shows an utter misunderstanding of how capitalists can depress wages separately from labor supply factors, and how workers have fought not just against lower bargaining power, but against the very logic of wage labor, in the past. Right On! The full-timers supported admin’s attempts to discourage adjuncts at HCC from forming a union. We won anyways and formed the first adjunct union in Florida, but we will get ZERO support from the HCC full-time faculty union in our fight with HCC admin. in the future, because they view us a threat and don’t accept the “rising tide raises all ships” dialogue that we attempt to charm them with. They don’t seem to realize that any gains our union makes for us in pay at HCC makes it less and less profitable for HCC to continue to eliminate full-time lines and replace them with 3-4 adjunct hires. Really, what kind of union allows half their jobs to be cut over a 20-year span in order to merely maintain their pay rate to inflation level raises? They have been losing their battle with admin. for years, that’s why we (adjuncts who teach full-time hours) exist in the first place. You are a professor and you write “anyways”? No wonder the students are so stupid. The argument is basically “there wouldn’t be an oversupply if they just created more jobs for us!”, which is true but silly and meaningless. Of course if this was a magical dream world and all the adjunct jobs turned into tenure track positions the job market wouldn’t be as tight, but when people say there’s an oversupply of phds it’s because they are discussing the market as it currently exists. PhDs don’t want part time adjunct jobs stringing together some classes for $30,000 a year with no office or benefits. Also the first chart doesn’t indicate there’s no oversupply – it counts the percentage of phds who have found either a tt job OR a *postdoc*. But one of the reasons why so many PhDs have taken longer and longer postdocs is because there are so few TT jobs they have to languish for years and make their CVs competitive enough for the insane qualifications of new assistant professor positions. Abolish adjuncts and there would be an under-supply of PhDs. And don’t tell me that is impossible. Equal pay for equal work is a strong argument. 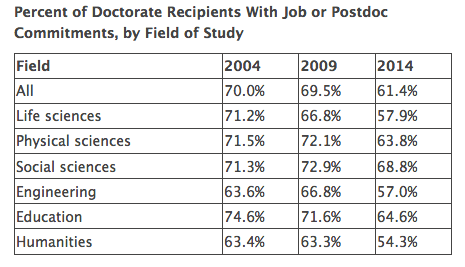 Most postdocs are teaching jobs. Adjunct positions are teaching jobs. And many many people who get PhDs teach by having these positions. So why exclude them from your conception of the job market? Science postdocs rarely have teaching. Typo: third paragraph; last sentence.